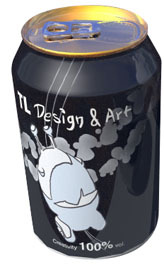 TL Design & Art does mainly designwork for print and digital media - from business cards, newspaper notices and adverts to catalogues, books and packaging, complete with new logos and images if needed. On the digital side there is web design. Flexible, functional and light. Modest smaller scale digital photography, video, animation and multimedia priduction. TL Design does not do the manufacturing or offer hosting. Clients often already have these or like to find them close by. If needed we will try to dig up some choices, of course. We have, though, made some single things by hand or printed small series of paper goods like cards and display cases. Commissioning conventional art can also be possible - drawings, paintings or clay sculpture. Other specialists can naturally be used when needed. We will work as you like, by including you in the process or not bothering you. Doing everything or just checking your work to make sure and offer suggestions. 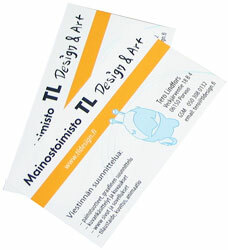 TL Design welcomes all sorts of clients or partners, private citizens, companies and organizations. For example, helping publishing houses with their workload. Tiny jobs, or as a part of a team for a big one.